This entry was posted in News Party on December 13, 2013 by admin. Doris a Sophia Lamošovy & spol. ‘Hot Sisters” je zbrusu nova kapela ktera vzesla z projektu ”Doris & The Swingin’ Bastards”.Jedna se o sesterskou dvojici, ktera miluje stary jazz a neboji se to na podiu poradne roztocit. Jejich Hot Jazz Vas urcite nenecha chladnymi. Mr. Karel Ctibor & DJ Kaya ( Radio 1) aka Prague Swingmaster jr. Author of the radio show Swing imperium and the organizer of Electro Swing River dance hall. 23:00 – ??:?? 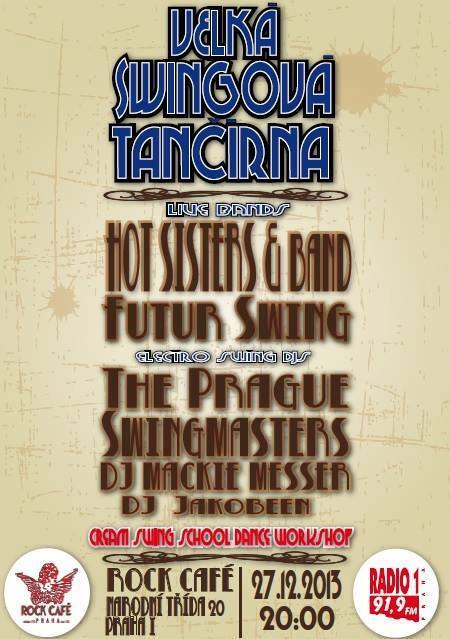 DJ Mackie Messer, Prague Swingmaster Jr…….